Updated 3/31/2019. Added Extra Credit section below about Melendrez Pass. 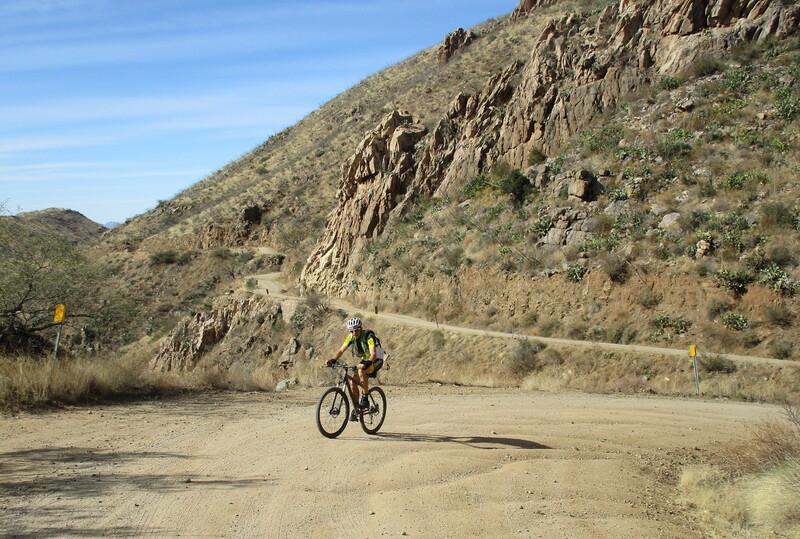 Box Canyon is a wonderful gravel grinder ride along a dirt road in front of Mt Wrightson. Once you get to the paved road up Madera Canyon, you have two options. Turn round and ride back, which gives you a round trip of about 28 miles with 2,126 feet of climbing. Drive down Highway 83 towards Sonoita. About 17.2 miles south of Interstate 10, between MM 42 and 41, there is a paved road heading to the right signed to Madera Canyon and Greaterville Road. Park in the big dirt parking area on the right. Ride along the paved road for about 3.2 miles to where the pavement ends. The dirt road immediate splits, and you take the right hand fork towards Madera Canyon. Follow the dirt road for about 10.6 miles, with lots of downhill, both steep and gentle. The part through Box Canyon itself is lovely, following a shelf along the north side of the Canyon. Just before the paved road, the dirt road splits twice. Take the left fork then the right fork. At the paved road, either turn round, or ride 5.9 miles up to the top of Madera Canyon, with 1,710 feet of climbing and lots of 11+% gradient near the top. If you need water, there’s a drinking fountain next to the bathrooms on the east side of the road, 1.2 miles from the top. Turn round and retrace your route. Once you start the dirt road, it’s pretty much uphill for 9.6 miles, gentle at first, then steeper as you ride up through Box Canyon. About 3.2 miles from Highway 83, where the paved road ends and the road splits, Box Canyon turns right. 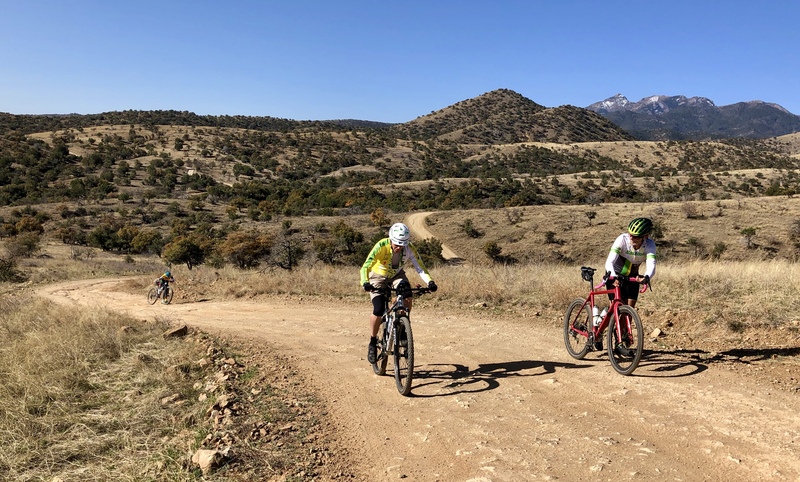 If you take the left hand fork, you follow a beautiful rolling road up to the radio towers on Melendrez Pass, giving a round-trip of 10.8 miles and 1,150 feet of climbing. Ride up the dirt road for about 1.3 miles to a 4-way junction. Turn right up the hill and follow the road to the radio towers, over some wonderful rollers. Skirt the first radio tower to the left, keep right at the next fork, then finish the ride just to the right of the second radio tower.